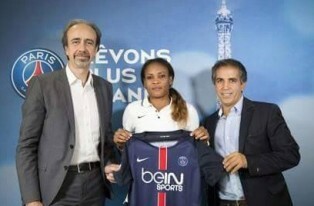 Paris Saint-Germain defender Ngozi Ebere has released a brief statement to allnigeriasoccer.com on her nomination for the Women Player of the Year Award by the Confederation of African Football. The 24 - year - old is the only Nigeria international that made the five - player shortlist and she will find out on January 7, 2016 if she will take home the accolade ahead of Gabrielle Onguéné, Gaelle Enganamouit (both Cameroon), N’rehy Tia Ines (Ivory Coast) and Ghanaian Portia Boakye. “I think I was nominated for this award because of my recent performances. A friend of mine first informed me that I have been nominated, ” Ngozi Ebere told allnigeriasoccer.com. The former Rivers Angels star has appeared four times for Paris Saint-Germain in the Division 1 Féminine , while she is yet to debut in the Champions League but has made the 18 - player squad on three occasions. Mercy Akide, Perpetua Nkwocha, Cynthia Uwak and Asisat Oshoala have won the African Women’s Footballer of the Year Award in the past.